After taking a five-year break from commercial filmmaking following studio interference during the making of The Red Eagle, Wisit Sasanatieng has now written and directed รุ่นพี่, a horror/romance film aimed at a mainstream teenage audience. รุ่นพี่ is Wisit's third ghost film, as he previously directed The Unseeable and Nang Nak. The central character, Mon, studies at a Catholic school in present-day Bangkok, though she can sense the ghost of a senior student who studied there before it became a convent school. He tells her that the building's original owner was killed fifty years ago in mysterious circumstances, and they investigate the murder case together. With its flashbacks to half a century ago, รุ่นพี่ continues Wisit's fascination with period detail, as seen previously in Tears Of The Black Tiger and The Unseeable. It features malevolent ghosts and some horrific moments, including an unsettling sub-plot involving Mon's schoolfriend, though it combines this (quite incongruously) with a budding romance between Mon and the senior ghost. Wisit has also directed Citizen Dog, the music video เราเป็นคนไทย, the art film Norasinghavatar, and a segment of the anthology film Sawasdee Bangkok. He also wrote the outline for Slice (directed by Kongkiat Khomsiri), and he designed the posters for the Bangkok International Film Festival in 2008 and 2009. 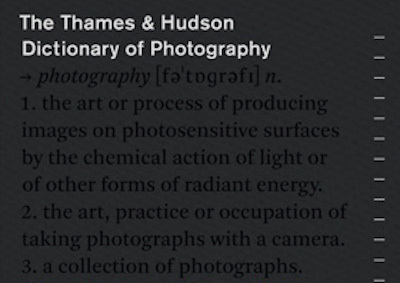 The Thames & Hudson Dictionary Of Photography contains more than 1,000 entries, two-thirds of which are capsule biographies of significant photographers. As editor Nathalie Herschdorfer notes in her preface, the ubiquity of digital information means that "it may seem almost perverse to publish a dictionary on paper." Her purpose, she explains, was "to publish a book that reduces a seething mass of information to a structured and orderly work of reference." The resulting Dictionary is not only authoritative but also elegantly designed and printed. Some of the world's most famous photographs are included: Richard Avedon's portrait of Dovima with two elephants, Eddie Adams's snapshot of a Viet Cong prisoner's execution, Robert Capa's picture showing the death of a Spanish Civil War fighter, Nicephore Niepce's view from a Le Gras window, Robert Doisneau's The Kiss, and Henry Peach Robinson's Fading Away. There are also images from some of the most influential photography monographs, including The Pencil Of Nature (William Henry Fox Talbot), The Decisive Moment (Henri Cartier-Bresson), and Die Welt Ist Schon (Albert Renger-Patzsch). The Dictionary's only serious rival is The Focal Encyclopedia Of Photography. Both works cover the art and technology of photography, though the Dictionary's emphasis is primarily on art while the Encyclopedia focuses more on technology. One of the advantages of the Encyclopedia is its extended bibliographic essay, though it contains very few photographic illustrations. The Dictionary includes 300 photographs, though it has no bibliography. Other (lesser) photography reference books include The Photography Book, Photography Visionaries, 100 Ideas That Changed Photography, Photographers A-Z, and The Visual Dictionary Of Photography. The Thames & Hudson Dictionary Of Photography is one of a series of arts dictionaries published by Thames & Hudson, including dictionaries of Art Terms, Graphic Design & Designers, and Fashion & Fashion Designers. Beaumont Newhall wrote the first history of photography as an art form, The History Of Photography, which was originally published as a MoMA exhibition catalogue. Helmut Gernsheim's The History Of Photography, dedicated to Newhall, discusses the early development of photography. Naomi Rosenblum's A World History Of Photography became the standard modern history of the subject. Mary Warner Marien's Photography: A Cultural History is the most recent, and most comprehensive, survey of photographic history. François Truffaut's book Hitchcock is one of the best books ever written about film. It was the first time that such an extensive interview with a director had been published, and it helped to popularise the 'auteur theory'. (Hitchcock was released a year before Andrew Sarris wrote The American Cinema.) It inspired many other in-depth interview books, notably those by Peter Bogdanovich (This Is Orson Welles and Who The Devil Made It) and Richard Schickel (The Men Who Made The Movies, Woody Allen: A Life In Film, and Conversations With Scorsese). In articles for Cahiers Du Cinema, Truffaut and other critics maintained that directors, rather than producers or script-writers, were the true authors of the films they made. His most famous essay, Une Certaine Tendance Du Cinema Francais (1954), was a "deliberately pessimistic examination I have undertaken of a certain tendency of the French cinema". Truffaut also directed one of the key films of the French new wave, The 400 Blows. Robert Fischer made a short documentary for German television, Monsieur Truffaut Trifft Mr Hitchcock (1999), about the background to Truffaut's book. 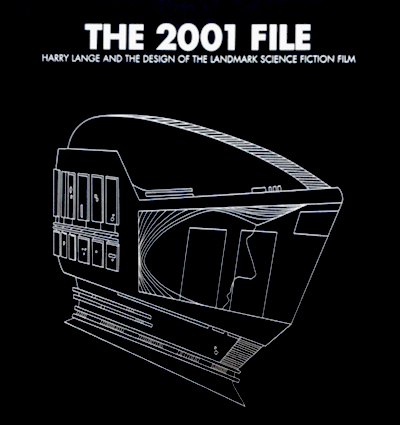 A feature-length documentary by Kent Jones, Hitchcock/Truffaut, was released this year and features directors such as Martin Scorsese and David Fincher discussing their love of Truffaut's book and Hitchcock's films. Peter Bogdanovich also appears, and his This Is Orson Welles is the nearest equivalent to Truffaut's book. 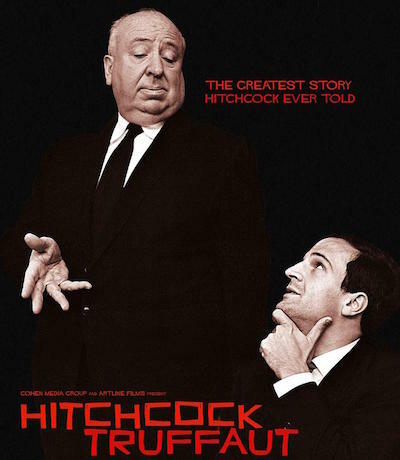 Hitchcock/Truffaut features detailed discussions of Vertigo and Psycho, though it presumes some prior knowledge of Hitchcock's work: major aspects of his modus operandi, such as his definition of the MacGuffin, and his distinction between suspense and surprise, are excluded. His famous remark that "actors are cattle" is included, though not explained. 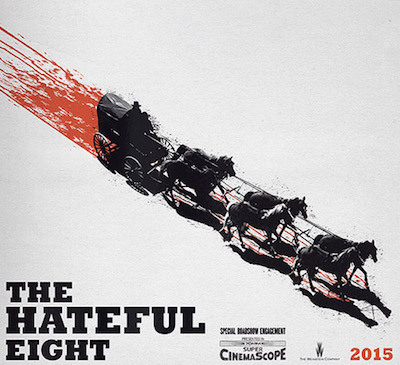 The Hateful Eight is Quentin Tarantino's eighth film. I know that not only because I've seen the previous seven (Reservoir Dogs, Pulp Fiction, Jackie Brown, Kill Bill, Death Proof, Inglourious Basterds, and Django Unchained) but because the opening titles announce it as "the 8th film by Quentin Tarantino". The 'hateful eight' (clearly the antithesis of The Magnificent Seven) are all heading, for various reasons, to Red Rock, Wyoming, though a blizzard forces them to take shelter at Minnie's Haberdashery. The only woman among them, Daisy Domergue, has a bounty on her head, and almost everyone has secrets and deceptions that are eventually revealed. Some of the backstories remain ambiguous and unresolved, with the audience left to judge what is true or false. The film is almost three hours long, and divided into six chapters, though the plot doesn't really begin until chapter four. Even after this, the tension doesn't reach the level of the farmhouse and basement tavern sequences in Inglourious Basterds. The first draft of the script (which has a different ending) was leaked online last year, and Tarantino organised a live table-read of that draft in Los Angeles shortly afterwards. The cast includes Samuel L Jackson (Pulp Fiction, Jackie Brown, Inglourious Basterds, and Django Unchained), Michael Madsen (Reservoir Dogs), Tim Roth (Reservoir Dogs and Pulp Fiction), Kurt Russell (Death Proof), and Zoe Bell (also Death Proof). Jackson plays an African American bounty-hunter, like the title character in Django Unchained. Tarantino delivers a brief voice-over at the start of chapter four. Jackson and Walton Goggins give outstanding performances; in fact, the hateful eight are all so fascinating that the innocent characters in the flashback sequence seem one-dimensional in comparison. This is essentially a chamber piece, with the action almost completely confined to a single location - the interior of Minnie's Haberdashery - just as Reservoir Dogs took place largely in a warehouse. (It's also reminiscent of two Humphrey Bogart films: The Petrified Forest and Key Largo.) The flashback reveals a shift in point-of-view, as in Pulp Fiction's diner-robbery scenes and Jackie Brown's shopping-mall sequence. Like all Tarantino films, The Hateful Eight has its share of violence, with an exploding head being the most graphic example; the violent climax is especially similar to Django Unchained. Also, as in Pulp Fiction, Jackie Brown, and Django Unchained, 'the n-word' is used throughout, despite an early line acknowledging the word's pejorative impact: "don't you know that darkies don't like being called niggers no more? They find it offensive." The Hateful Eight was filmed with 65mm cameras, and is projected in Ultra Panavision, with an extremely wide 2.76:1 aspect ratio, only a fraction less than Cinerama's 2.77:1. (Ultra Panavision was the widest of the widescreen processes developed in the 1950s as anamorphic alternatives to Cinerama; it was used most notably for Ben-Hur in 1959.) As in early CinemaScope films such as The Robe, the wide frame emphasises the blocking of the actors, which looks simultaneously theatrical and cinematic. The film has been released in a standard version (which is the one I've seen) and a 70mm roadshow version, which includes an overture, intermission, and several minutes of additional footage: the exact opposite of the grindhouse experience Tarantino recreated with Death Proof. Like Christopher Nolan with Interstellar, he is using The Hateful Eight to highlight the superiority of 70mm distribution. 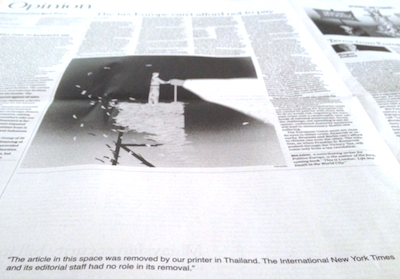 The International New York Times has been censored by its Thai printer for the fourth time this year. An article on page four of today's newspaper was replaced by a blank space and a brief explanation: "The article in this space was removed by our printer in Thailand. The International New York Times and its editorial staff had no role in its removal." The article, headlined "Thai man may go to prison for insulting king's dog", is a report by Thomas Fuller about Thanakorn Siripaiboon, who was arrested last week and charged with lèse-majesté. As the headline suggests, the charges against Thanakorn reflect a wider interpretation of the lèse-majesté law, though this aspect of the case has not been mentioned by mainstream Thai media. 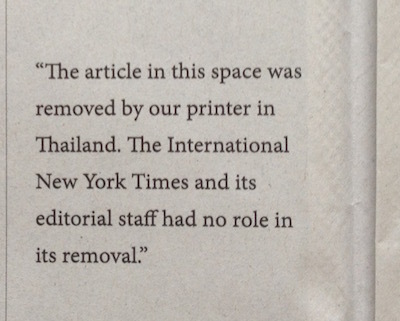 Two previous International New York Times articles were also censored by the newspaper's Thai printer this month, and on 22nd September the company refused to print the newspaper altogether. 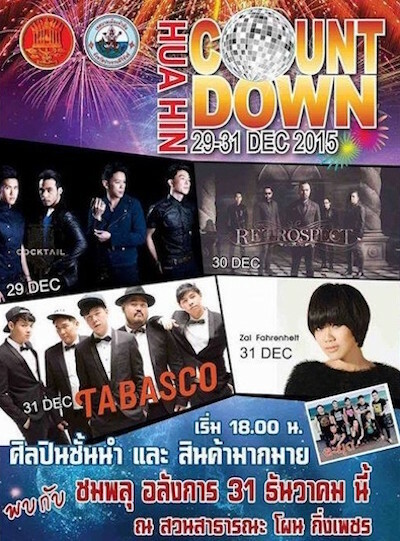 Perhaps unsurprisingly, the newspaper will cease its print distribution in Thailand on 31st December. In 2007, TCM broadcast an exhaustive two-part documentary on Marlon Brando. The film (Brando, written by Mimi Freedman and produced by Leslie Grief) was a chronological account of Brando's life, featuring talking-head interviews with seemingly everyone who had worked with him (except Francis Coppola and Jack Nicholson). Listen To Me Marlon, directed by Stevan Riley, takes a completely different approach: this documentary's soundtrack consists entirely of monologues spoken by Brando himself, excerpted from hundreds of cassette tapes that he recorded throughout his life. These even include self-hypnosis tapes, one of which gives the film its title: "Marlon, listen to my voice..." The result is, at times, like the Kurtz monologues recorded on reel-to-reel tapes in Apocalypse Now. This audio diary is illustrated by Brando film clips (including A Streetcar Named Desire, The Wild One, On The Waterfront, The Godfather, and Apocalypse Now) and home-movie footage. Key events in Brando's life are summarised by clips from TV news reports, as an alternative to a conventional narrator. Brando's head was digitally scanned in the 1990s, and this ethereal facsimile of his face is animated in synch with his voice-over, creating the ghost of Brando. Listen To Me Marlon is similar in format to Marlene, Maximilian Schell's documentary about Marlene Dietrich. Like Brando, Dietrich was a legendary star who became a recluse. She refused to appear on camera in Schell's documentary, so he relied entirely on audio of her voice from taped interviews. Also, both documentaries feature sets that meticulously recreate the living spaces of their respective stars. The Brando tapes are fascinating precisely because Brando himself was so private. He was probably the greatest actor in cinema history, though he rarely gave interviews or made public appearances. Exceptionally, he appeared on CNN's Larry King Live in 1994, though only because he was contractually obliged to do so: "Unbeknownst to me, it was part of the contract, and if I didn't, I would be in breach of contract." The CNN interview was arranged to promote Brando's autobiography, Songs My Mother Taught Me, a work that's even more revealing than Listen To Me Marlon. 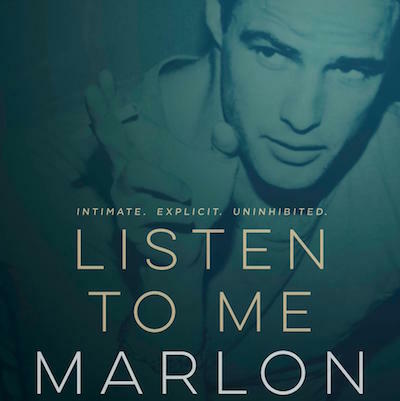 The book was largely written by Robert Lindsey - "I have filtered the story of Marlon's life," he explains in the introduction - whereas the film is told in Brando's own words. 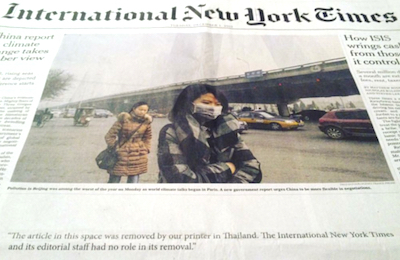 Twice this week, articles in the International New York Times have been censored in Thailand. On Tuesday, and again yesterday, the newspaper was printed with blank spaces and a brief explanation: "The article in this space was removed by our printer in Thailand. The International New York Times and its editorial staff had no role in its removal." The International New York Times is based in Paris, and its Asian edition is edited in Hong Kong, though it relies on the Eastern Printing Company to print copies for distribution in Thailand. On 22nd September, the company refused to print the newspaper altogether; the newspaper sent a letter to its subscribers explaining that "our locally contracted printer deemed [it] too sensitive to print. This decision was made solely by the printer and is not endorsed by the International New York Times." On Tuesday, the printer objected to an article headlined "Thai spirits sagging with the economy". The story, by Thomas Fuller, highlighted Thailand's economic downturn following last year's coup. Yesterday's problematic article was an op-ed by Tom Felix Joehnk headlined "The Thai Monarchy and its Money", which called for more transparency regarding the Crown Property Bureau. The Financial Times is distributed in Thailand though printed elsewhere, and is therefore not reliant on censorious Thai printers. On 22nd November last year, it published a review of A Kingdom In Crisis that would certainly have been censored had it been printed in Thailand. Like the FT, The Economist is also distributed in Thailand though printed externally; its publisher chooses not to distribute any issue that contains 'sensitive' content, such as the issue published on 6th December 2008. State censorship of the media is rare, as most Thai journalists practice self-censorship to avoid potential 'attitude adjustment' sessions or lèse-majesté charges. However, there have been a few examples of the military government intimidating the media. Pravit Rojanaphruk (a columnist for The Nation) and Thanapol Eawsakul (editor of Same Sky) were both detained for several days last year. 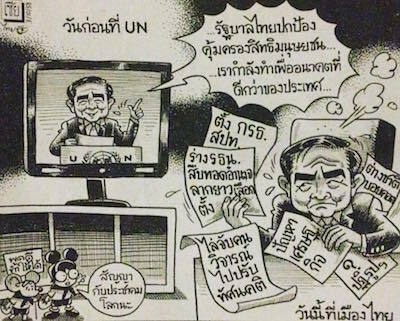 Thai Rath cartoonist Sakda Sa-Aeow (known as Sia) was visited by the police who took exception to his 3rd October cartoon portraying Prayuth at the UN. MICT asked the Bangkok Post to delete an article from its website on 15th October. Local censorship of the International New York Times is not unique to Thailand. On 22nd March last year, an article alleging that Pakistan's security services sheltered Osama bin Laden was removed by its Pakistani printer. Also in Pakistan, an article about Charlie Hebdo was censored on 14th January. Most bizarrely, the faces of pigs in two photographs were censored by Malaysian printers on 21st January, as the printer felt that such images would be offensive to Muslims.